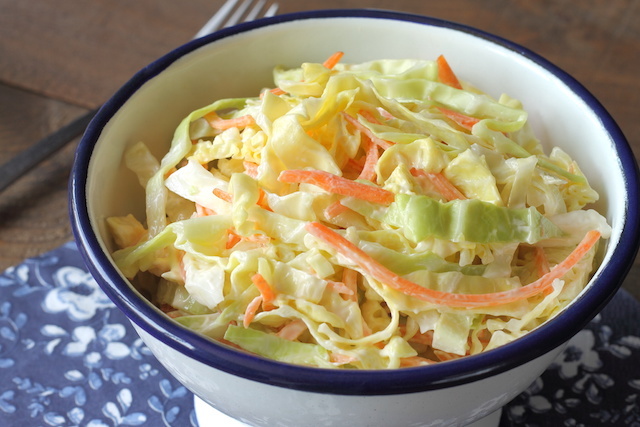 Learning how to make cole slaw is simple with this recipe. Although everybody prepares slaw a little different, coleslaw is a versatile side dish that can be found throughout the country. Whether you are at barbecue, church gathering, fish fry, picnic, or birthday party you will see people eating and enjoying this dish. My favorite time to serve slaw is when I prepare pulled pork or fry fish..the slaw makes for a great side item to go along with these two meals. Besides tasting good and being a soul food favorite, this dish is very easy to make. The recipe we will teach is easy to follow containing the very basic ingredient of cabbage, carrots, mayonnaise, cream and seasoning. For a more visually appealing presentation you can use different varieties of cabbage to add color to your slaw. All said, try out the recipe if you're ready to leave a lasting impression at your next social function. As always the key to great cooking is to be prepared and to use quality ingredients. Prepare cabbage for cooking by cleaning and shredding your cabbage and carrots. You could also find and use a package of precut cabbage and carrots in your local grocery store. Combine all ingredients in a mixing bowl. Mix thoroughly to ensure your slaw is well coated. Add more mayonnaise and seasonings to taste. Transfer your finished slaw to a serving bowl and refrigerate for about an hour before serving. The slaw should be served cold.